Assurance Technologies Principles and Practices is based on the assertion that safety is not a cost, but an excellent investment. According to the authors, more than sixty percent of problems in complex systems arise from incomplete, vague, and poorly written specifications. In keeping with the authors' passion for safety, the text is dedicated to uniting the gamut of disciplines that are essential for effective design applying assurance technology principles, including system safety, reliability, maintainability, human engineering, quality, logistics, software integrity, and system integration. Readers familiar with the first edition of this text will recognize all the hallmarks that have made it a classic in its field. The Second Edition features a host of new examples, methods, techniques, and best practices to bring the text fully up to date with the state of the art in assurance technology. 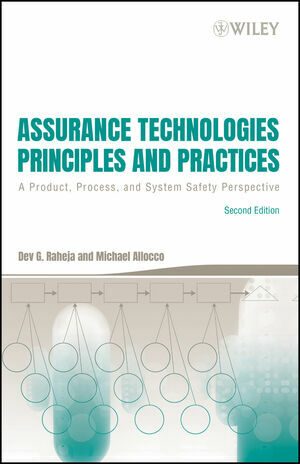 The text begins with an introduction and overview of assurance technology. Next, readers are provided with fundamental statistical concepts. The chapters that follow explore in depth the approaches and disciplines that make up assurance technology applications. Each chapter is organized into major phases-design, manufacturing, test, and use phase-that help readers understand both how and when to apply particular measures. Throughout the text, readers discover detailed examples that prepare them to manage real-world challenges. References and further reading are provided at the end of each chapter leading to more in-depth discussion on specialized topics. With its extensive use of examples and highly structured approach, this is an excellent course book for students in industrial engineering, systems engineering, risk engineering, and other assurance technology domains. Design and system engineers as well as safety professionals will find the material essential in troubleshooting complex projects and ensuring product, process, and system safety. DEV G. RAHEJA is a world leader in system assurance technologies. He is founder and President of Design for Competitiveness, Inc., a former executive with General Electric and Booz Allen Hamilton, and has done consulting and training for automotive, aerospace, medical, defense, and many Fortune 500 high-tech corporations. He is the recipient of the Austin Bonis Reliability Education Advancement Award from the American Society for Quality for his pioneering work in reliability. He is a Fellow of the System Safety Society, and has received the Scientific Achievement Award and the Educator of the Year Award. He is also the Chairman of the IEEE Design for Reliability Technical Committee. MICHAEL ALLOCCO is a Fellow and former executive vice president of the System Safety Society and has received the Educator of the Year Award. He has over three decades of experience in safety engineering, system safety, and safety management and conducts graduate-level lectures in system safety engineering at major universities. He has applied system safety engineering on diverse complex systems for the general industry, DOT, DOD, DOE, and NASA. Chapter 1. Assurance Technologies, Profits, and Managing Safety-Related Risks. 1.2 Cheaper, Better, and Faster Products. 1.3 What is System Assurance. 1.5 Is System Assurance a Process?. Chapter 2. Introduction to Statistical Concepts. Construction of a histogram and the empirical distribution. Failure rate and hazard function. 2.9 Topics for Student Projects and Theses. Chapter 3. Reliability Engineering and Safety-related Applications. 3.2 Reliability in the Design Phase. 3.3 Reliability in the Manufacturing Phase. 3.4 Reliability in the Test Phase. 3.5 Reliability in the Use Phase. 3.6 Reliability and Safety Commonalities. 3.7 Topics foe Student Projects and Theses. Chapter 4. Maintainability Engineering and Safety-related Applications. 4.2 Maintainability during the Design Phase. 4.3 Maintainability in the Manufacturing Stage. 4.4 Maintainability in the Test Stage. 4.5 Maintainability in the Use Stage. 4.6 Maintainability and System Safety. 4.7 Topics for Student Projects and Theses. Chapter 5. System Safety Engineering. 5.2 System Safety in Design. 5.3 System Safety in manufacturing. 5.4 System Safety in the Test Stage. 5.5 System Safety in the Use Stage. 5.6 Analyzing System Hazards and Risks. 5.8 Topics for Student Projects and Theses. Chapter 6. Quality Assurance Engineering and Preventing Latent Safety Defects. 6.2 Quality Assurance in the Design Phase. 6.4 Quality Assurance in the Test Phase. 6.5 Quality Assurance in the Use Phase. 6.6 Topics for Student Projects and Theses. Chapter 7. Logistics Support Engineering and System Safety Considerations. 7.2 Logistics Engineering during the Design Phase. 7.3 Logistics Engineering during the Manufacturing Phase. 7.4 Logistics Engineering during the Test Phase. 7.5 Logistics Engineering in the Use Phase. 7.6 Logistics Support Engineering and System Safety. 7.7 Topics for Student Projects and Theses. Chapter 8. Human Factors Engineering and System Safety Considerations. 8.2 Human Factors in the Design Phase. 8.3 Human Factors in the Manufacturing Phase. 8.4 Human Factors in the Test Phase. 8.5 Human Factors in the Use Phase. 8.6 Additional considerations involving Human Factors and System Safety. 8.7 Real Time and Latent Errors. 8.8 Analyses in Support of Human Factors and System Safety. 8.9 Topics for Student Projects and Theses. Chapter 9. Software Performance Assurance. 9.2 Software Performance in the Design Phase. 9.3 Software Requirements during Coding and Integration. 9.5 Software Performance in the Use Stage. 9.6 Topics for Student Projects and Theses. 10.4 Managing by Life-Cycle Costs. 10.7 System Risk and Effects on System Effectiveness. 10.8 Topics for Student Projects and Theses. Chapter 11. Managing Safety-Related Risks. 11.1 Establish the Appropriate Safety Program to Manage Risk. 11.2 Programs to Address Product, Process, and System Safety. 11.3 Resource Allocation and Coast Analysis in Safety Management. 11.4 Topics for Student Projects and Theses. Chapter 12. Statistical Concepts, Loss Analysis, and Safety-Related Applications. 12.1 Use of Distributions and Statistical Applications Associated with Safety. 12.2 Statistical Analysis Techniques used within Safety Analysis. 12.3 Using Statistical Control in Decision-Making for Safety. 12.5 Calculating Hazardous Exposures to the Human System. 12.6 Topics for Student Projects and Theses. Chapter 13. Models, Concepts and Examples: Applying Scenario-Driven Hazard Analysis. 13.2 Designing Formats for Conducting Analysis and Reporting Results. 13.5 Lifecycle of a System Accident. 13.6 Operating and Support Hazard Analysis Example. 13.7 Topics for Student Projects and Theses. Additional Reading and Reference Sources. Chapter 14. Automation, Computer, and Software Complexities. 14.3 Understanding the Adverse Sequence. 14.4 Additional Software Safety Analysis Techniques. 14.6 Complexities and Hazards within Computer Hardware. 14.7 Initiators, contributors, the Errors Associated with Software. 14.8 Other Specialized Techniques, Analysis Methods, and Tools for Evaluating Software and Computer Systems. 14.9 Existing Legacy Systems, Reusable Software, Commercial Off-the-Shelf Software (COTS) and Non-Development Items (NDI). 14.10 Topics for Student Projects and Theses.